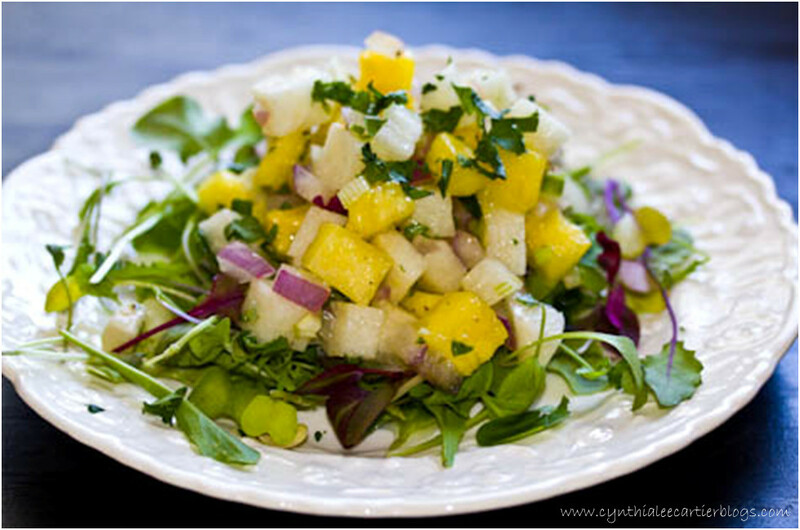 In a large salad bowl, combine jicama, pineapple, green and red onion and cilantro. In a large measuring cup or bowl whisk together dressing ingredients and then pour on the salad ingredients and toss to coat well. The salt will settle at the bottom of the cup or bowl, so scrape the sides and bottom to make sure all the seasoning is mixed into the salad. Serve at room temperature or refrigerate and serve cold as a side dish, with chips or crackers, loaded into a wrap or added to a green salad; served here on a bed of organic micro-greens.